After it came out in 1902, the 9mm Luger became one of the most popular handgun rounds in the world. 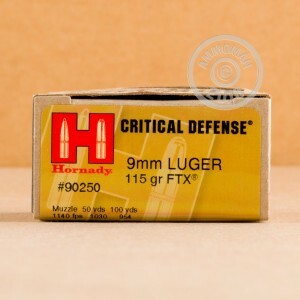 Used all over the globe for military, civilian, and law enforcement purposes through the years, this round has been proven as a fantastic self defense round. Founded right after World War Two, Hornady has continued in its mission to provide incredibly high quality ammunition across America. 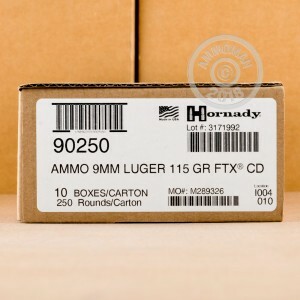 These FTX jacketed hollow point rounds are a fine example of the superior ammunition Hornady provides. 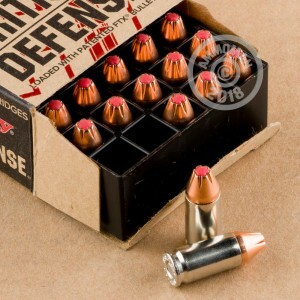 These 115 grain, Critical Defense rounds feature high accuracy, fantastic expansion, and great energy release, making for a phenomenal self defense round. Great, fast service and fantastic round for pistol and carbine. Quick delivery of a very good defensive round in 2 Glocks and a Ruger PC9 carbine. no failures.